Akiles has been widely known for their high quality and durable binding machines and their CoilMac Series is no different. There are five CoilMac's available, some with two versions (a standard and a plus), so the confusion determining which is which, and which is best for you, is understandable and quite common. Well let me help clear the air, as I outline the most important features and key differences for each of the Akiles CoilMac spiral machines. There are manual punching and binds, manual / electric combos, and fully electric options, as well as a few "in between" options as well. Each was designed with a specific kind of user and volume in mind, so read on to learn which CoilMac machine is best for you. The Akiles CoilMac-M and CoilMac-M Plus spiral binding machines offer efficiency and productivity, without the high price point, and were designed for lower volumes of workloads, such as those of a small business. They feature manual punching and binding; the manual punching is performed with the handle, while the manual binding / inserting is performed by hand on the inserting table on the front of the machine. This means you manually spin the coil in through the holes. The crimping of the ends is also manual, done with either a pair of optional cutter crimper pliers, or an electric crimping machine (both sold separately). You can see in the comparison chart above that the only differences between the "standard" and "plus" CoilMac Manual binding machines are the hole shape, the pitch / hole spacing, and the number of disengageable pins. The plus is preferred by customers who will be binding the larger size coils, as the oval holes allow for much easier inserting of the coils. You can even see inserting speeds up to 50% faster than with round holes. The slight different in hole spacing (called pitch) was also perfected for a perfect hole:edge ratio on letter size documents. It is also great for those who will be binding multiple sheet sizes, as the ability to disengage all of the punching pins allows for customization of your sheet sizes, without ending up with half of a hole on the end of your page. The binding edge allows for up to a 13" long book, and the open end allows for punching even extra long books up to double that size (so up to 26") by simply flipping over your sheets and punching them again. While the CoilMac M and CoilMac M Plus are both manual punch and manual bind machines, they feature an inserting table on the front that helps you curve your book block to prepare it for coil inserting, as well as helps assist you in inserting your coil, by offering a dent in the table that the coils fit into (rather than them rubbing on a flat table with each turn). Anyone who has tried inserting spiral coils using two hands without a table know it slows down down production significantly, so this table helps you be more efficient. Hand cutter crimper pliers separately are available to cut and crimp in the ends of the coil, finishing the bind. Because of the high quality components and full range of functions, the Akiles CoilMac M is the most complete and durable manual spiral binding machine in its class. It measures 13” x 17.5” x 18” and weighs about 35 pounds. It comes standard with a one year manufacturer’s warranty. The CoilMac M is perfect for home and personal use, as well as small offices. 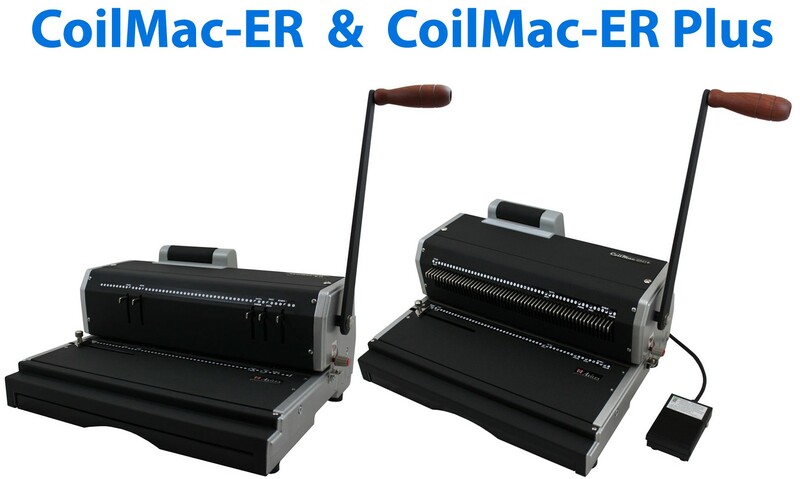 The Akiles CoilMac-ER and ER Plus spiral binding machines feature the low expensive of a manual punch, with the speed increase of a mini single-roller coil inserter attached to the top of the machines. These coil machines were designed for lower volumes of workloads, such as those of a small business, but who are tired of manually rolling in the coils through every hole. The single-roller is not the fastest or most efficient roller, and the small size also plays into that, but it can be a great help for those lower volume users who want a little boost without the higher expense of a full electric inserter. The finishing / crimping of each end of coil can be done with separate crimping pliers, or with an electric crimping machine. Just as with the CoilMac M machines, the difference between the standard and plus models includes three differences...the hole shape, the hole spacing, and the number of the pins that can be disengaged. The binding edge of your book can be up to the 13" width of the punching throat, but because it is open-ended, you can also punch even larger sheets that can be up to double the edge, for up to a 26" book. To do this, you just have to punch one side of your book, flip it over and align it on the peg, then punch again. The CoilMac ER and ER Plus feature the curved inserting table, which can help you form the spine of your book into the ideal curve for inserting, as well as serve as the station for your manual inserting through the first few holes. There is a small electric inserter on top of the unit with a single-roller. This mini inserter can be used to roll the coil through your thinner books the rest of the way, but doesn't work that well for thicker books. It can help make the process a bit quicker, without requiring a full investment into the full size 2-roller inserters like in the machines listed below. Once inserted, the crimping of the ends can be done manually with included crimper pliers or electrically with a separate machine. 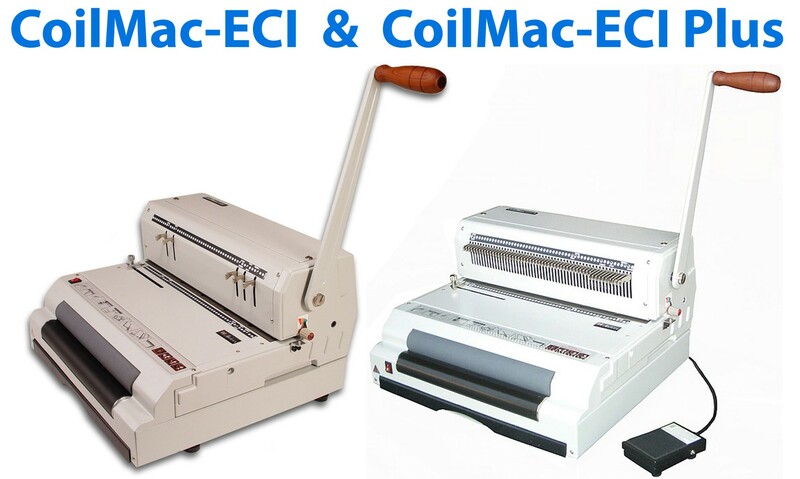 The Akiles CoilMac ECI and CoilMac ECI Plus bring the convenience of a full-sizes double-roller electric inserter to the low-cost of a manual punch, making it perfect for small and medium sized offices that need to punch fairly often, and want the speed and convenience of the inserting rollers. Just as with the other machines, the difference between the standard and plus ECI punch and bind models include three differences: the hole shape (standard is round, plus is oval), the hole spacing (plus has a slightly varied spacing that is still compatible with standard coils, but makes for perfect letter size bound books), and the number of the pins that can be disengaged (the plus has fully disengageable pins for any sheet size). The open binding edge allows for double the binding edge length of the machine by simply punching, then slipping your book and punching again. The CoilMac ECI and ECI Plus will punch your pages manually when you pull the handle. Always roll your coil in through the first few holes first, then hold your coil against the rollers while you push the foot pedal to activate them. It takes a little getting used to for a new user, but once you pick up the technique, you can products inserted books at incredible speeds, as compared to manual inserting. Once done, manually crimp each end with the included cut/crimp pliers or use a separate electric coil crimping machine. The AKiles Coilmac EX and EX Plus spiral binding machines were produced for mid-sized volumes with frequent spiral binding needs who need the speed and convenience of electric punching and electric binding, without the price point required for the more production-level driven machines. It was manufactured to offer these electric conveniences for lower volume users, as it needs more rest time than production-level machines, but still has those quick features. The same differences apply for the standard and plus option: the EX with round holes and the EX Plus with oval, the EX with standard 4:1 spacing and the EX Plus with special 4:1 (0.248) spacing, and the EX with 5 disengageable pins and the EX Plus with all disengageable pins. 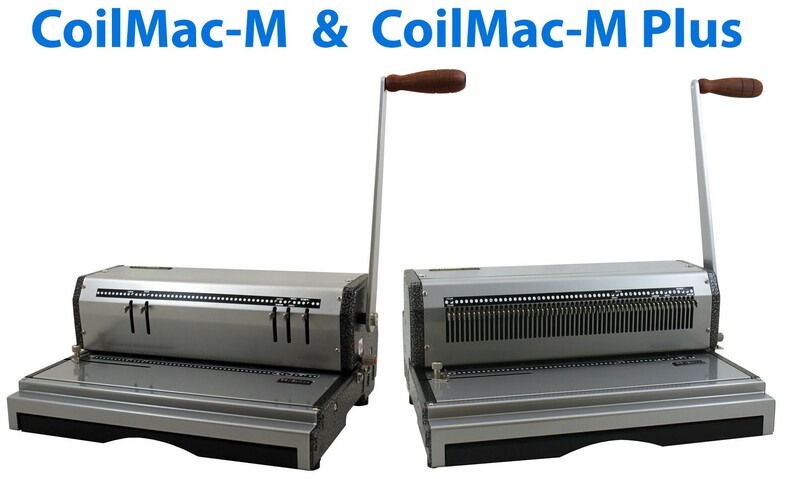 Just as with the other CoilMacs, the CoilMac EX machines also have open binding edges that allow for double the binding edge length of the machine by simply punching, then slipping your book and punching again. The CoilMac EX and EX Plus will punch your pages electrically by the touch of a foot pedal. That pedal can go on the floor or on the table, if you prefer to tap it by hand. The inserter rollers are turned on with a push button so you can turn it on and off, as needed. Once done, manually crimp each end with the included cut/crimp pliers or use a separate electric crimper machine. The CoilMac EPI and EPI Plus machines offer electric punching and binding for higher volume users, such as a large office. It was actually the first of its kind many years ago, and has since only been improved and perfected for durable and efficient use. The EPI features an Electro-Magnetic Brake, giving it the capability to handle heavier loads, provide a longer life, & always offer trouble free punching. The reverse, or anti-jam, function easily removes paper jams that are caused by overloading the punching throat or overflowing waste drawers. The foot pedal operated built-in electric coil inserter allows the operator the free working of both hands and complete control of the roller and book. The U-shaped alignment channel aides in conforming the spine of larger documents to the coil's shape, for faster and easier insertion. The all metal construction is heavy duty and built to last. Just as with the CoilMac M & ECI, the CoilMac EPI Plus Model features oval holes with a true 4:1 pitch that offers a perfectly centered letter size punch without any adjustments. The oval holes make inserting so much quicker and easier, that it can increase your productivity as much as 50%. The 53 fully disengageable punching pins allow for perfect hole patterns with a larger variety o sheet sizes. 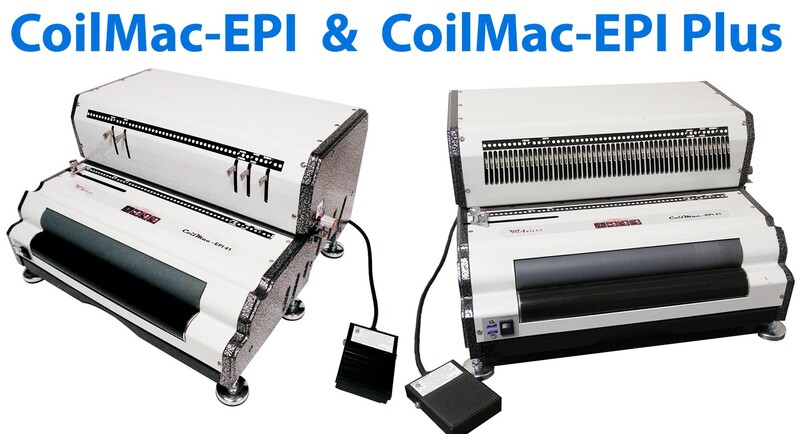 The CoilMac EPI Electric Binding Machine is perfect for office & professional use with higher volume needs. The heavy duty motor, durable metal construction and anti-jam features make this machine a top choice for anyone looking to speed the spiral binding process with a easy-to-use machine. Remember, when comparing all of the CoilMac machines die-by-side that the differences between the standard and plus models are always the same, which is why I have omitted them from the below chart to simplify it. No matter which model machine you choose, you are buying the best spiral binding machine when you buy an Akiles Coilmac online at Binding101. They are built for durability, accuracy, and ease of use. Questions? Please call our customer care team at (866)537-2244.